For other uses, see Cleethorpes (disambiguation). Cleethorpes is a seaside resort on the estuary of the Humber in North East Lincolnshire with a population of nearly 40,000 in 2011. It has been permanently occupied since the 6th century, with fishing as its original industry, then developing into a resort in the 19th century. The resort expanded following the linking of the town by railway with industrial towns in Yorkshire. Cleethorpes Pier opened in 1873 and the promenade in 1885. Cleethorpes with Thrunscoe was created as a Local Board of Health District in 1873, and under the Local Government Act of 1894 it became an urban district. Cleethorpes has undergone significant redevelopment, with JD's Nightclub and the Lifeboat Hotel both being demolished to build flats overlooking the beach.[when?] The Winter Gardens, a venue for a variety of events, was also demolished in 2007. In 2007 a North East Lincolnshire Council's committee accepted proposals for the demolished Cleethorpes Winter Gardens to be replaced by 47 flats. This resulted in some local opposition. A new multiplex cinema, Parkway Cinema, was built in Cleethorpes in 2004, along with other developments such as McDonald's, KFC and Taco Bell at the Meridian site. The old mini steam railway running from the seafront Leisure centre to St Anthony's bank has been extended and significantly improved whilst a cafe and gallery has been added to the boating lake, many ducks and geese use the boating lake to breed making it a pleasant place to visit. A large open air show ground has been built close to the eastern end of the boating lake often showing live bands and hosting special events, most notably hosting the London 2012 Olympic torch relay. The Greenwich meridian passes through the town and a signpost shows some distances to worldwide locations. North Pole 4,051 km (2,517 mi), South Pole 15,963 km (9,919 mi), New York City 5,602 km (3,481 mi), London 230 km (143 mi). From Cleethorpes railway station, operated by TransPennine Express, train services run, via Grimsby, to Barton-upon-Humber (for bus link to Hull), Manchester Airport (South TransPennine) and Newark-on-Trent. Trains to London are available by travelling to Doncaster then switching to services to London Kings Cross. The railway station is also served by Northern and East Midlands Trains. Cleethorpes is at the end of the A180, A16 and A46 roads. Secondary schools in Cleethorpes include Cleethorpes Academy and Beacon Academy. The parish church is St Peter's, built in 1866. Other churches are St Francis of Assisi on Sandringham Road, and Holy Trinity and St Mary's Church in Old Clee, the oldest building (built 950 AD) in Grimsby. Christ Church of Cleethorpes, near Machray Place, is also one of the larger parishes. [further explanation needed] St Aidan's Church on the A180 Grimsby Road was administered in the 1950s and early 1960s by John Hurt's father. Cleethorpes Town F.C. play in the NCEL Division One. Their home matches are played at the Linden Homes Club, Clee Road, Grimsby. Leisure/other sports The old Cleethorpes bathing pool was demolished and replaced in the eighties with a modern leisure centre. Facilities include a large indoor wave pool, badminton and squash courts, a gym and sports hall. The local badminton club meets here. 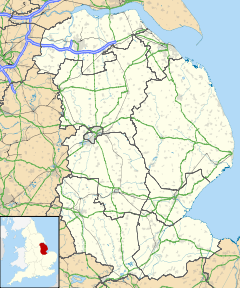 Cleethorpes is currently part of the parliamentary constituency of the same name, which also includes other towns in the area, including Immingham and Barton-upon-Humber. Prior to 1997, Cleethorpes had been included in the constituencies of Brigg and Cleethorpes, Louth (Lincolnshire) and Grimsby. Since 1996 Cleethorpes has formed an unparished area in the unitary borough of North East Lincolnshire. Cleethorpes comprises three of the borough's sixteen wards: Croft Baker, Haverstoe and Sidney Sussex. Each ward returns three councillors, so Cleethorpes is represented by 9 of 42 members of the council. Cleethorpes does not have its own town council; however, the nine councillors form the Charter Trustees of the Town of Cleethorpes. Wikimedia Commons has media related to Cleethorpes. While commonly referred to as a seaside resort, Cleethorpes actually sits on the Humber Estuary. The sea at Cleethorpes is actually the mouth of the Humber. This means that bathers are separated from the sea by several hundred metres of sand at low tide. The Cleethorpes Leisure Centre was opened in 1983 to replace the open bathing pool that was wrecked by storms on 11 January 1978. The leisure centre contains a 33-metre pool, 1.8 metres deep, as well as a water slide and a wave machine. The building also contains a gym and a sports hall. In 2012, major work was carried out to the roof of the building due to water damage. Ross Castle, a mock ruin of a castle built in 1885 by the Manchester, Sheffield and Lincolnshire Railway, was named after Edward Ross, secretary of the railway company. Its height was the highest point on the cliffs. After a period of closure, the castle was renovated, re-opening in June 2008 to the public. Possibilities of a further closure have been raised after a woman fell to her death on 9 January 2009. In 2007 the town was the Royal Horticultural Societies Britain in Bloom award winner in the coastal category. The town was also received a Silver-Gilt award, a Tourism Award and Jeff Blanchard the Shredded Wheat Community Champions award. A statue of the Boy with the Leaking Boot was given to the town in 1918 by John Carlborn. It is reported that he was a Swedish immigrant to Cleethorpes who had built up a successful shipping business, and that the statue was a copy of one in the Hasselbacken Restaurant in Stockholm, Sweden. The Cleethorpes statue stood in the Pier Gardens but is now in the town hall, with a replica on display on the sea front close to the leisure centre. A nearby public house, the Leaking Boot, was destroyed by fire in June 2009, with the land left derelict until late 2017 when construction of houses was started. Michael Parsons, singer, songwriter and earlier member of the boyband called District3. Chisholm, Hugh, ed. (1911). "Cleethorpes" . Encyclopædia Britannica. 6 (11th ed.). Cambridge University Press. p. 478. ^ C W Foster, ed. (1920). "Introduction: Lost vills and other forgotten places". Final Concords of the County of Lincoln: 1244-1272. British History Online. Retrieved 22 July 2008. ^ "Cleethorpes - A Potted History". North East Lincolnshire Directory. Archived from the original on 24 July 2008. Retrieved 22 July 2008. ^ a b "Timeline". cleethorpesuk.com. Archived from the original on 19 January 2013. Retrieved 22 July 2008. ^ Samuel Lewis, ed. (1848). "Cleethorpe". A Topographical Dictionary of England. British History Online. Retrieved 22 July 2008. ^ "Vision welcomed". 7 April 2009. Archived from the original on 30 June 2012. Retrieved 29 July 2016. ^ "About Cleethorpes". Cleethorpes Conservatives. Retrieved 12 July 2018. ^ "Winter Gardens Cleethorpes". Linc2u Marketing. Retrieved 29 July 2016. ^ "Cleethorpes 1981–2010 averages". Met Office. Retrieved 24 July 2017. ^ "Welcome :: Cleethorpes Athletic Club". Retrieved 29 July 2016. ^ "Sports Ground, Cleethorpes". Cricket Archive. Retrieved 6 August 2010. ^ "The Charter Trustees Regulations 1996 (S.I. 1996 No. 263)". Office for Public Sector Information. 1996. Retrieved 24 July 2008. ^ "RNLI: Cleethorpes". Retrieved 25 January 2014. ^ "Cleethorpes Rescue Service's four decades keeping people safe by the sea". Grimsby Telegraph. 28 January 2011. Archived from the original on 25 January 2015. Retrieved 25 January 2015. ^ "Probe continues into death of woman after Ross Castle fall". 10 January 2009. Archived from the original on 20 April 2009. Retrieved 29 July 2016. ^ "Leaking Boot". Archived from the original on 12 May 2008. Retrieved 9 July 2009. ^ "Hope for future of Leaking Boot site". Grimsby Telegraph. 2 July 2009. Archived from the original on 9 July 2009. Retrieved 9 July 2009. ^ "Jungle Zoo bosses hit back at protesters". Grimsby Telegraph. 19 April 2010. Archived from the original on 25 January 2015. Retrieved 25 January 2015. ^ Ash, Russell (1973). Folklore, Myths and Legends of Britain. Reader's Digest Association Limited. pp. 286–287. ISBN 9780340165973. ^ "Kristian Adams". Cricket Archive. Retrieved 29 June 2009. ^ "Obituary". The Times. 16 January 1958. p. 14. ^ Bateman, Colin (1993). If The Cap Fits. Tony Williams Publications. p. 43. ISBN 1-869833-21-X. ^ "Mrs Mangel From Neighbours". Comedy Central. Archived from the original on 25 August 2011. Retrieved 29 November 2013. Wikivoyage has a travel guide for Cleethorpes.